It is our goal to keep your pet happy here so you can enjoy your time away. Charges are calculated on a per night basis. Each night begins at the end of our regular office hours. There is no drop-off or pick-up after regular office hours. Veterinary services are charged according to regular Kitty Klinic prices and there will be a 'second trip' fee if the doctor must return on weekends specifically to treat your pet. We encourage you to bring familiar items from home for your pet, however they must be machine washable and we are not responsible for lost or damaged items. Please make a list of the items you want returned at the end of your pet's stay and we will make every attempt to do so. We will try to duplicate your pet's food and litter, within reason, to make the stay as home-like as possible. We stock Hills®, Iams®, Friskies® and Purina® products. If your pet has special needs beyond our standard food, please bring what you would like us to use. Our standard diet is Hills Adult Maintenance®. The economy boarding room is vented as a unit so there is minimal risk of disease spread by droplet. We require a distemper/respiratory vaccination prior to a stay in this room. We cannot be held responsible for sub-clinical diseases activated by the stress of being away from home. Strict sanitation procedures are followed at all times and pets are not allowed contact with other animals except family members. Hands are disinfected prior to handling any pet. 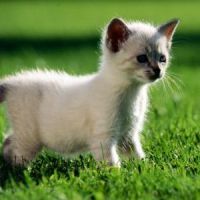 As of January 2012 a rabies vaccination is required by state law for all indoor and outdoor pet cats and ferrets. The Kitty Klinic and Kitty Komfort Inn require all cats to be in compliance by providing written proof of rabies vaccination for any overnight stay. Vaccine is available at the Kitty Klinic after a complete medical examination. The initial vaccine is good for one year and the booster for three yars. We require a pre-boarding physical for fragile geriatric, ill or diabetic cats that are not currently patients of the Kitty Klinic and well regulated. We will be happy to send for medical records from other veterinarians to include in your pet's file, but be aware this process may take up to 14 days to receive. Ill pets may be hospitalized in the Kitty Klinic and extremely ill pets may be transferred across the street to the Olympia Pet Emergency Hospital at night, as there is no staff in the building. We require 50% of the estimated bill at the time of check-in. Please leave an emergency number where you can be reached. If your pet should become ill while boarding we will make every attempt to reach you. 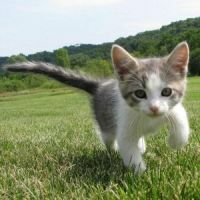 If you can not be contacted we will do the minimal work-up to diagnose and treat the problem at the Kitty Klinic. Your signature is taken as approval for this when boarding your pet. All animals are monitored twice a day by trained staff for appearance, alertness, appetite and litter box use. We will contact you if there is a problem. Written proof of vaccines (FVRCP) and Rabies are required for boarding. We prefer birds, reptiles and other exotics to board in their own cages to reduce stress. We have housing for rabbits, ferrets and other rodents. Call with any questions. We reserve the right to apply Advantage® or Revolution® to any pet that comes in with fleas or ear mites.